The Khulbuk (Hulbuk) palace complex and the residence of the Khuttalya rulers existed in the IX - XII cc. It has a territory of 600 x 200 meters and 15 m. high. It is divided into three parts: The large central courtyard with the entrance on the west and the two separated by this court. The southern part is officially representative and the northern is residential. The entrance structure is a traditional portal-peshtak with carved terracotta. 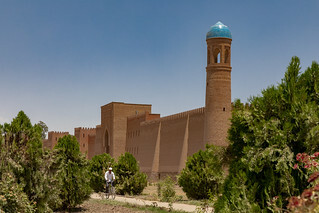 The castle is surrounded by fortress walls built of pakhsy and faced with baked bricks. Two-storied plinth was located along the foot of the wall, and the wall is strengthened with conical or rectangular retaining turrets. The round towers were built at the corners of the complex. The rooms of the palace are richly decorated with unique carved patterns (mixture of gypsum and clay) and paintings.